Here you can find a strain description about Out Of Body Experience and also some user-based reviews and infos directly from the SeedFinder (if available). 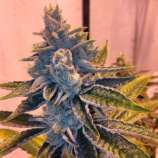 You can also find the offers and auctions here if Out Of Body Experience cannabis seeds are on stock at MyCannapot right now. An OBE or Out of Body Experience takes our consciousness beyond the physical realm. The conscious expansion of the mind is the basis for spiritual awakenings and psychedelic revelations. By seeing beyond the veil, we discover the inner-workings of the Most High. The Out of Body Experience is a combination of two potent parents. The Skywalker OG possesses a caramelized vanillin that creates whole-body relaxation and self-awareness. Grateful Breath contains explosive potency and frost. The OBE yields large stacked flowers exuding silky resin and good vibrations. Buy Out Of Body Experience now at MyCannapot!